Ready to be competitive and actually have fun getting healthy? To play, read the rules below and fill out this registration form and pay $20! 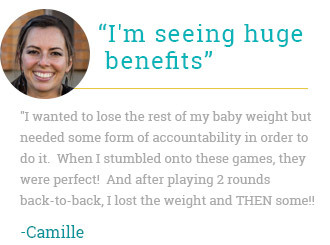 Hundreds of people have had success getting healthy by playing my 6 week Game-On Health Challenge. No matter your fitness level, you will get similar results with my new 21 day health challenge. Fill out this registration form and pay $20. Why a registration fee? $15 will go into a kitty for the winners. $5 goes towards PayPal fees, organizing, and hosting the game. Also, you need to put a little skin in the game to keep you motivated! According to your answers, I’ll divide challengers into three different fitness groups (beginner, intermediate, and advanced). Each group will have 3 different daily challenges varying in difficulty depending on your fitness level. If you’re a beginner, the challenges will be much easier than those who are considered advanced. You will only compete against others with your same fitness level. The day before the round begins, I’ll email you with your three daily challenges (see examples of possible challenges below). In order to get 1 point, you must complete one of your daily challenges (3 points per day possible). I will also give you two bonus challenges. If you complete one of the bonus challenges for all 21 days, you get a bonus day. Complete both for all 21 days, you get two bonus days. Total possible points with bonuses is 65. No screen time (TV, email, social media, games, etc.) after 9 pm. Come play! Just fill out this registration form and pay $20! I’ll be in touch soon.